The best day of David’s life was the day he got his first bike. Riding a bike exposes us to the elements, and puts us in touch with our environment and ourselves. But thousands of young people in the District lack this opportunity. Since 1991, David dreamed of applying the knowledge he gained working for environmental nonprofits to the underserved youth of D.C. He also draws on his considerable knowledge and skills gained as master mechanic at one of Georgetown’s busiest bike shops. 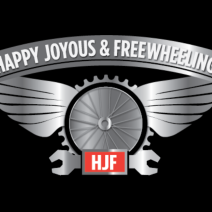 Founding Happy, Joyous and Freewheeling is the realization of this dream. HJF is a 501c3 non-profit incorporated in the District of Columbia. We believe in mastering bicycle maintenance as a means of empowering underserved populations to achieve self-reliance, employability, transportation, improved health, community and personal well-being. HJF strives to improve the lives of young people from lower income households by building bridges to the local bicycling community in the DC metro area. We promote activities and programs that build life skills, encourage physical health, and promote positive values. Our main mission is to work with middle school and high-school students with special outreach to ensure equal participation by women and girls. We teach safe riding and bicycle maintenance skills in schools and throughout the community. We run clinics and workshops for adults and families, at community centers, partnering with other non-profits, and through employer sponsored programs.